Product code: ES7085 Categories: Sold Items, Sold Jewellery. Perfect for day or night, this antique shakudo necklace will always be commented on and is as unique as it is beautiful. Shakudo is an alloy of gold and copper, having around 4 to 10% gold and 90 to 96% copper, and was originally designed for swords such as the katana (long sword) fittings and other pieces such as the kozuka (the grip of a small knife) Japanese swords, and after the end of the samurai class grew obsolete, the shakudo masters turned their attention to jewellery. 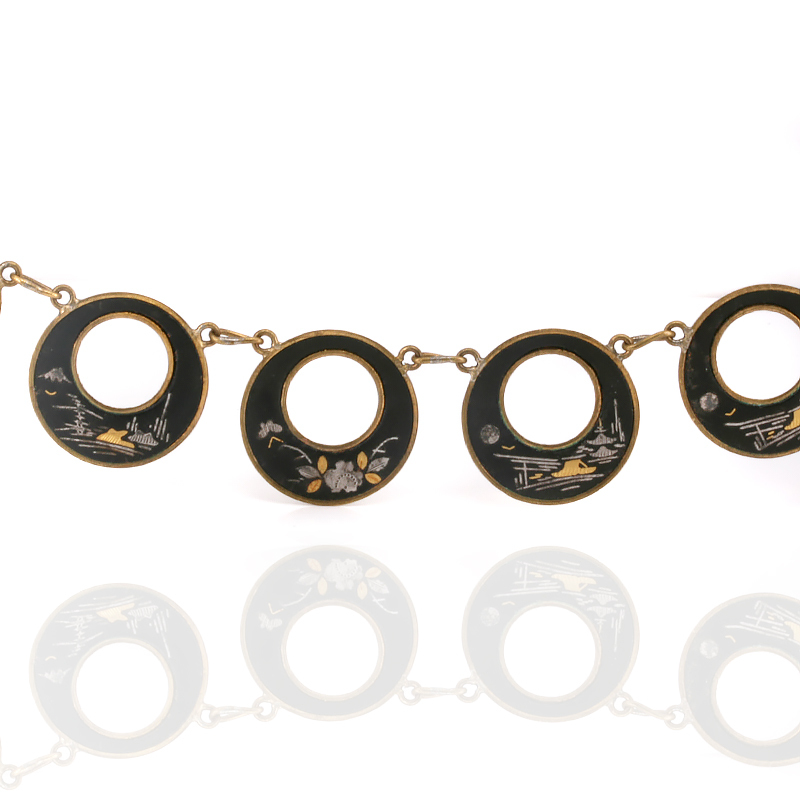 Dating from the Meiji period of the early 1900's, this necklace is made up of twenty round shakudo panels and the clasp. The pieces are actually round and each one measures 28.4mm in diameter, however as they all have a round section cut out at the top, it gives the illusion that they are oval which is a very clever technique used in this necklace. From end to end the necklace measures 43cm in length and sits just perfectly on the neckline where it will always be loved and admired.